Following hot on the heels of the voluntary move by the alcohol industry, knife manufacturers across the UK are applying warning labels to their products in an effort raise awareness of the challenges of knife ownership. "We recognise that in today’s modern Britain more and more products are being affixed with warning labels and, well, as manufacturers of some very sharp implements we didn’t want to be left out," explained Naomi Smith, CEO of her family’s forging business in Sheffield. The warning labels follow the model of those that have for years been increasing in size and directness on tobacco products. "We have gone for quite direct messages," explained Mrs Smith. "So for example our meat cleavers now carry a large warning message about its sharp edge." 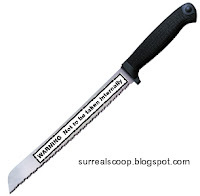 The family firm, Billingsworth Steel, has full ranges of knives and cooking utensils both with and without warning labels. "We have to face the reality, our knives are not only used by professional chefs in top restaurants, but also by stupid people in Manchester and therefore we feel we can now cater for both groups," she said. The Chef’s Knife in the labelled range bears the warning ‘Risk of blindness if poked in eyes’ whilst users of the serrated bread-knife are told that it is ‘Not to be taken internally’. Hahaha. 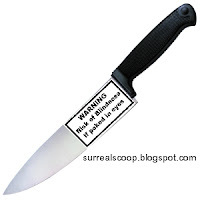 Who's stupider: people who think there should be warning labels on knives, or the people who don't know that knives are sharp? Which one exists in larger quantities? Where can i get a blunt knife for safety? Use a spoon when hunting? Remember that lady who spilled hot coffee on her lap at the McDonald's drive through? She may be stupid but you gotta admit - she's rich now!